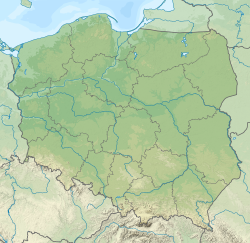 Bytom (Polish pronunciation: [ˈbɨtɔm] ( listen); Silesian: Bytůń, German: Beuthen O.S.) 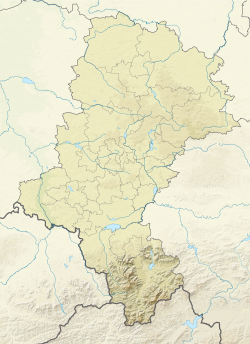 is a city with powiat rights in southern Poland, in Silesia, in centre of Metropolitan Association of Upper Silesia and Dąbrowa Basin. One of the oldest cities in the Upper Silesia. The former seat of the Piast dukes of the Duchy of Bytom. Until 1532 it remained in the hands of the Silesian Piasts, then it belonged to the Hohenzollern dynasty and since 1623 - The Donnersmarck family as a State country. In the years 1742-1945 the town was within the borders of Prussia and Germany and played an important role as an economic and administrative centre of the local industrial region. Until the outbreak of World War II it was the main centre of national, social, cultural and publishing organisations fighting to preserve Polish identity in Upper Silesia. After the war, a large part of the native population emigrated or was deported to Germany as a result of the displacement of Germans (or those who were considered Germans), and men (especially miners) to the Soviet Union. In turn from Kresy numerous Poles have come here resettled from areas incorporated into the USSR. Decades of the Polish People's Republic were characterized by a constant emphasis on the development of heavy industry, leading to robbery and mining exploitation. Today, the city is an important place on the cultural, entertainment and industrial map of the region. In 1945 the city was transferred to Poland as a result of the Potsdam Conference. Its German population was largely expelled by the Soviet Army, and replaced by a Polish population, some of them repatriated Poles from the eastern provinces annexed by the Soviets. Some of the indigenous Silesian population remained. ^ "Wyniki badań bieżących - Baza Demografia - Główny Urząd Statystyczny" (in Polish). demografia.stat.gov.pl. Retrieved 2018-05-05. ^ DESIGN, ARF. 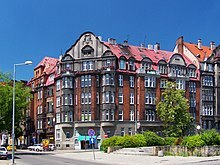 "Bytomskie Centrum Kultury". www.becek.pl. Wikivoyage has a travel guide for Bytom. Wikimedia Commons has media related to Bytom.